Instagram is a social network, so why wouldn’t you be social? If someone leaves a comment, answer them. And do so using their handle, so they get a notification that you replied. You can just swipe left to see the reply button: press that and it appears instantly in the comment box. Don’t get me wrong: if the comment is abusive, you should report it and delete it (also available when you swipe left on a comment).There’s no need to reply to that awful stuff. Posting the same image taken five different ways is annoying. Plus, I’m not going to like all of them. If you really want to share similar images, space them out over a week or a month. This will ensure that each post gets its own share of likes, and it won’t clog up your friends’ feeds. Another good piece of advice: make sure they’re good pictures. Nix anything out-of-focus, really grainy, or too dark to see properly. You can only add up to 30 hashtags in one comment. Whether that seems excessive or not, only use hashtags that are relevant to the picture. If your picture was taken in Oregon, for example, don’t include the other 49 states in your hashtags. 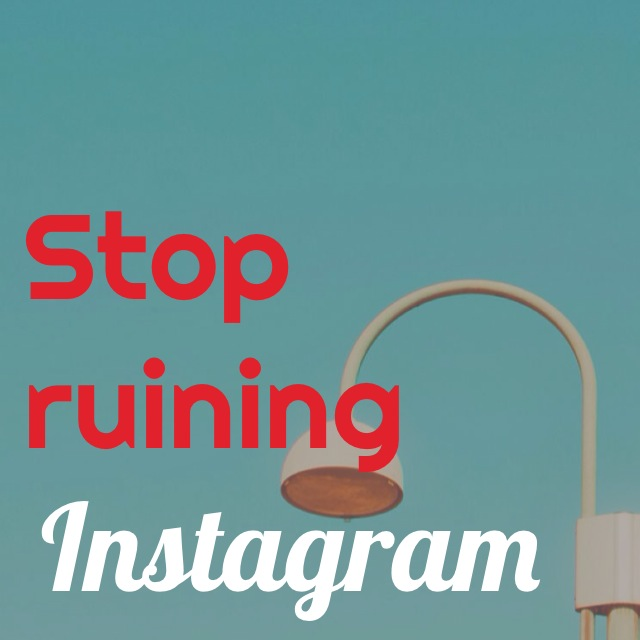 If you’re participating in one of Instagram’s Weekend Hashtag Projects, don’t use the hashtag on a picture that has nothing to do with the weekend’s theme. For the record, I average about 15 – 20, which is a lot. I usually include hashtags for location, editing apps, and maybe a few descriptors. Instagram is about photos. If you want to share an inspiring message, you can literally create one using apps like Studio (my personal fave–I used it to create the graphic for this blog), Over, or A Beautiful Mess. If you want to just share an image you like, you can do that on Pinterest, Tumblr, or We Heart It. No need to do it on Instagram. 5. Don’t beg for likes or follows. Because it’s just sad. If #like4like has gotten you somewhere, think about exactly where that is. What do you hate seeing on Instagram? Leave a comment below! Nice article – thank you. I’m a new user to Instagram, I love trees so I do post pics of the trees I find interesting, I’m in no way a professional photographer – not sure if that’s boring for other viewers. I don’t like seeing “ordinary” pics of new babies w/aunts and uncles – I find I only follow people who post interesting pics. Hi! Thank you for sharing an interesting suggestions with us, I totally agreed with you that, most of the brands use hash tags for advertising purpose and it is disgusting thing. Umm… I hate seeing people post the same types of photos over and over. I’m basically looking at all the moms and dads out there who post photos that are obviously documenting every minute of little Sasha opening her Christmas presents. Same thing for dogs/cats/weasels. And plants. Also… if the majority of the people who follow you on Instagram are also friends with you on Facebook, don’t share your IG photos to FB. It’s not interesting or useful to me to see the same photos twice. And finally… the “daily post” photo challenges. I’m not talking about the one-photo-a-day challenges that result in a different photo, but the challenges such as 365 days of headstands. No one needs to see 365 headstands. One is enough.